"Mshweshwe" redirects here. For the traditional South African fabric, see Shweshwe. 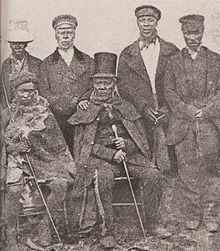 Moshoeshoe (/mʊˈʃwɛʃwɛ/) (c. 1786 – 11 March 1870) was born at Menkhoaneng in the northern part of present-day Lesotho. He was the first son of Mokhachane, a minor chief of the Bamokoteli lineage- a branch of the Koena (crocodile) clan. In his early childhood, he helped his father gain power over some other smaller clans. At the age of 34 Moshoeshoe formed his own clan and became a chief. He and his followers settled at the Butha-Buthe Mountain. Moshoeshoe was the first son of Mokhachane, a minor chief of the Bamokoteli sub-clan of the Basotho people. He was born at Menkhoaneng in Botha-bothe, Lesotho as Lepoqo. Moshoeshoe and his agemates went to initiation school and he got the name Letlama meaning strong bond. During his youth just after initiation, he was very brave and once organised a cattle raid against Ramonaheng and captured several herds. As was the tradition, he composed a poem praising himself where, amongst the words he used to refer to himself, said he was "like a razor which has shaved all Ramonaheng's beards", referring to his successful raid. In Sesotho language, a razor is said to make a "shoe...shoe..." sound, and after that he was affectionately called Moshoeshoe: "the shaver". He also referred himself as the person of Kali, thus showed that he was a descendant of the Great Kali or Monaheng who is said to be the ancestor of most Bakoena people in Lesotho with the exception of the senior Bamolibeli. Moshoeshoe and his followers, mostly the Bakoena Bamokoteli, some Bafokeng from his maternal side and other relations as well as some clans including the Amazizi, established his village at Butha-Buthe, where his settlement and reign coincided with the growth in power of the well-known Zulu King, Shaka and what is now known as the 'time of troubles' (previously known as 'Difaqane'). During the early 19th century Shaka raided many smaller chiefdoms along the eastern coast of Southern Africa (modern day Kwa-Zulu Natal), incorporating parts of them into his steadily growing Zulu chiefdom. Various small clans were forced to flee the Zulu chief. An era of great wars of calamity followed, known as the time of troubles/Difaqane. It was marked by aggression against the Sotho people by the invading Nguni clans. The attacks also forced Moshoeshoe to move his settlement to the Qiloane plateau. The name was later changed to Thaba Bosiu or "mountain at night" because it was believed to grow during the night and shrink during day. It proved to be an impassable stronghold against enemies. The most significant role Moshoeshoe played as a diplomat was his acts of friendship towards his beaten enemies. He provided land and protection to various people and this strengthened the growing Basotho nation. His influence and followers grew with the integration of a number of refugees and victims of the wars of calamity. By the latter part of the 19th century, Moshoeshoe established the nation of the Basotho, in Basutoland. He was popularly known as Morena e Moholo/morena oa Basotho (Great King/King of the Basotho). Guns were introduced with the arrival of the Dutch from the Cape Colony and Moshoeshoe determined that he needed these and a white advisor. From other tribes, he heard of the benefits missionaries brought. By chance, three representatives of the Society arrived in the heart of southern Africa: Eugène Casalis [fr], Constant Gosselin [fr] and Thomas Arbousset [fr]. Moshoeshoe brought them to his kingdom. Later Roman Catholic Missionaries were to have a great influence on the shape of Basotho History (the first being, Bishop M.F. Allard O.M.I. and Fr. Joseph Gerard O.M.I.). From 1837 to 1855 Casalis played the role of Moshoeshoe's Foreign Advisor. With his knowledge of the non-African world, he was able to inform and advise the king in his dealings with hostile foreigners. He also served as an interpreter for Moshoeshoe in his dealings with white people, and documented the Sesotho language. In the late 1830s, Boer trekkers from the Cape Colony showed up on the western borders of Basutoland and subsequently claimed land rights. The trekkers' pioneer in this area was Jan de Winnaar, who settled in the Matlakeng area in May–June 1838. As more farmers were moving into the area they tried to colonise the land between the two rivers, even north of the Caledon, claiming that it had been "abandoned" by the Sotho people. Moshoeshoe, when hearing of the trekker settlement above the junction, stated that "... the ground on which they were belonged to me, but I had no objections to their flocks grazing there until such time as they were able to proceed further; on condition, however, that they remained in peace with my people and recognised my authority." Eugène Casalis later remarked that the trekkers had humbly asked for temporary rights while they were still few in number, but that when they felt "strong enough to throw off the mask" they went back on their initial intention. The next 30 years were marked by conflicts. Moshoeshoe signed a treaty with the British Governor, Sir George Thomas Napier. Among the provisions of this treaty was the annexation of a tract of land (now called the Orange River Sovereignty) that many Boers had settled. The outraged Boers were suppressed in a brief skirmish in 1848, but remained bitter at both the British and the Sotho. The situation erupted in 1851. A British force was defeated by the Sotho army at Kolonyama, touching off an embarrassing war for the British. After repulsing another British attack in 1852, Moshoeshoe sent an appeal to the British commander that allowed him to save face. Once again, diplomacy saved the Sotho kingdom. After a final defeat of the Tloka in 1853, Moshoeshoe reigned supreme. However, the British pulled out of the region in 1854, causing the de facto formation of two independent states: the Boer Orange Free State and the Sotho Kingdom. In 1858 Moshoeshoe defeated the Boers in the Free State–Basotho War and in 1865 Moshoeshoe lost a great portion of the western lowlands. The last war in 1867 ended only when the British and Moshoeshoe appealed to Queen Victoria, who agreed to make Basutoland a British protectorate in 1868. The British were eager to check Boer advances, and Moshoeshoe, with advice from Eugene Casalis, realised that continued pressure from the Boers would lead to the destruction of his kingdom. In 1869, the British signed a treaty at Aliwal with the Boers. It defined the boundaries of Basutoland and later Lesotho; those boundaries have not changed. The arable land west of the Caledon River remained in Boer hands, and is referred to as the Lost or Conquered Territory. This effectively reduced Moshoeshoe's kingdom to half its previous size. Grave of Moshoeshoe I atop Thaba Bosiu. Although he had ceded much territory, Moshoeshoe never suffered a major military defeat and retained most of his kingdom and all of his culture. His death in 1870 marked the end of the traditional era and the beginning of the modern colonial period. Moshoeshoe Day is a national holiday in Lesotho celebrated every year on 11 March to commemorate the day of Moshoeshoe's death. Moshoeshoe I International Airport is named in his honour. South African-made shweshwe fabric is named for King Moshoeshoe I who once received a gift of it and then popularized it throughout his realm. In episode two of the American animated series Animaniacs, the debuting Pinky and the Brain segment "Win Big" referenced Moshoeshoe I briefly when the Brain attempted to win $99,000 on a quiz show entitled "Gyp-parody" so that he might construct a machine that would magnetically hold to the earth any one with loose change in his pockets. One of the categories in the Jeopardy!-like game show is "Kings Named Moshoeshoe", to whose first answer, "He ruled Lestho [sic] in 1820", Brain gives the proper question, "Who was King Moshoeshoe I?" The program makes an error in date, as Moshoeshoe did not become monarch until 1822. ^ "Mshweshwe". Encyclopædia Britannica. 2008. Retrieved 7 April 2008. ^ Soszynski, Henry. "LESOTHO". members.iinet.net.au. ^ Eldredge, Elizabeth A. (22 July 2017). "Kingdoms and Chiefdoms of Southeastern Africa: Oral Traditions and History, 1400-1830". Boydell & Brewer – via Google Books. ^ Kuper, Jeremy (19 April 2013). "London shows material interest in Africa's old clothes". Mail & Guardian. Archived from the original on 25 May 2013. Retrieved 20 January 2014. ^ Holmes, Thalia (22 November 2013). "The fabric of society needs underpinning". Mail & Guardian. Archived from the original on 20 January 2014. Retrieved 20 January 2014. This page was last edited on 30 November 2018, at 12:22 (UTC).